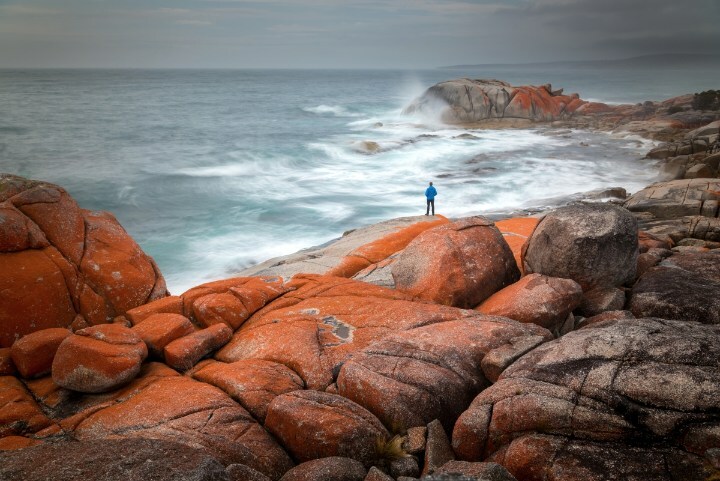 Explore remote landscapes admiring awe inspiring scenery along the east coast of Tasmania on the 4-day-3-night Bay of Fires luxury guided walk. You will discover one of the most pristine natural environments in the world, traversing soft sandy beaches and secluded coves, kayaking the famous Ansons River and ending each day in the comfort of luxury accommodation. The iconic Bay of Fires is famed for its spectacular and pristine coastline. Stretching over 50 kilometres from Binalong Bay in the south to Eddystone Point in the north, the region is renowned for it's jaw-dropping scenery from the turquoise-coloured ocean breaking onto a breathtakingly white beach to the rugged rock formations draped with orange lichen. This beautiful part of Tasmania's east coast has been named by Lonely Planet as the hottest travel destination in the world, and is widely regarded as one of the most beautiful places in Australia. Twin share accommodation for the first two nights is at the comfortable Forester Beach Camp, nestled in a protected dune swale behind a glorious white sand beach within the National Park. The final night's accommodation is at the luxurious Bay of Fires Lodge. The Bay of Fires Lodge enjoys views up and down the pristine white sandy beaches in an area of great significance to the Aboriginal community. 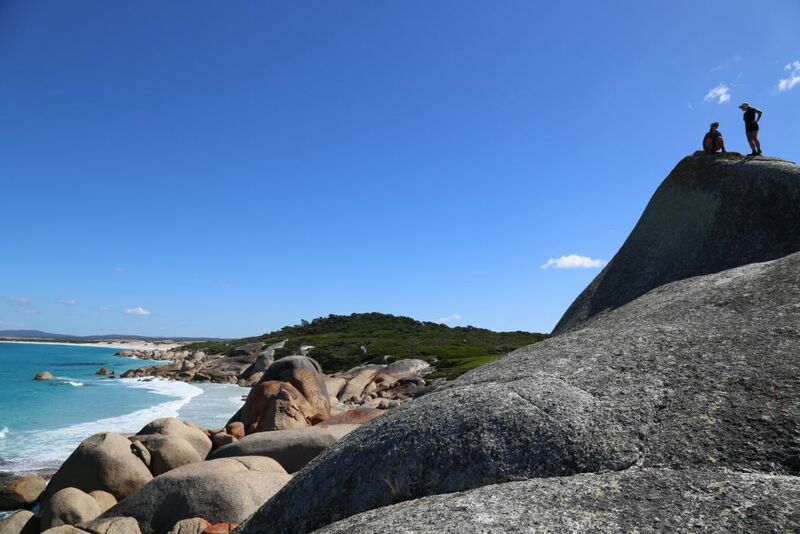 The experience includes three days of guided walking from Mt William National Park to Bay of Fires. Expert field guides will enhance your journey with their knowledge and understanding of the flora, fauna, geology and history of the local area. All meals and transfers to and from Launceston are included. This walk offers a true immersion in the natural surroundings. Walk for miles along sugar-white sandy beaches, swim in the impossibly clear ocean, and feel like you're the only person to have ever set foot here. Luxury walk at the iconic location: Bay of Fires spectacular and pristine coastline, was named by Captain Tobias Furneaux in 1773 following the many Aboriginal fires he sighted as he sailed by. The slice of coastal heaven that is the Bay of Fires stretches over 50 kilometres from Binalong Bay in the south to Eddystone Point in the north. The sight is simply jaw-dropping: the turquoise-coloured ocean breaks onto a breathtakingly white beach fringed with huge boulders draped with iconic orange lichen. This beautiful part of Tasmania's east coast has been named by Lonely Planet as the hottest travel destination in the world, and is widely regarded as one of the most beautiful places in Australia. Walk for miles along sugar-white sandy beaches, swim in the impossibly clear ocean, and feel like you're the only person to have ever set foot here. 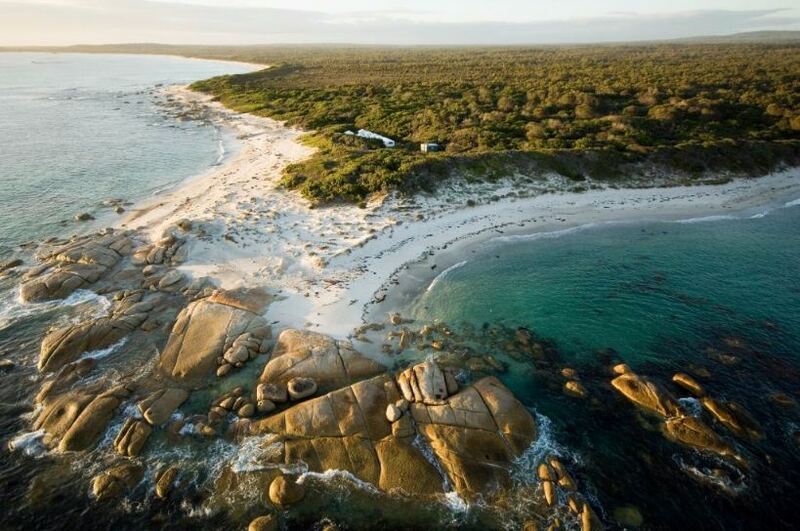 Exclusive accommodation: You have exclusive use of the Forester Beach Camp and the award winning Bay of Fires Lodge. No need to sleep in tents with uncomfortable mattresses and sandy floors, our accommodation is an important aspect of the walk and we believe it should be enjoyed not endured! 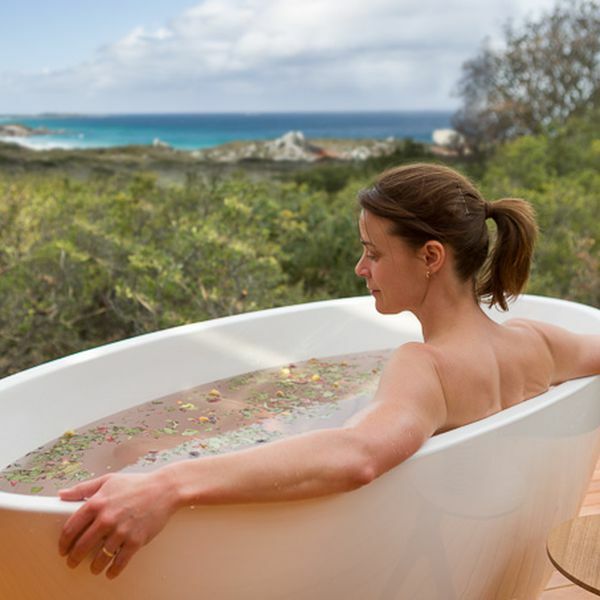 The Bay of Fires Lodge Spa: The Bay of Fires Lodge Spa is the proud winner of the 2014 'Best LI'TYA Eco Spa' and is located in surroundings so unique they are world recognised. The Bay of Fires Lodge Spa is inspired by the revival of indigenous healing practices that has its roots in the Australian Aboriginal Dreaming and harnesses the restorative, clarifying and invigorating properties of Australia's native botanicals through the use of skincare creator Li'Tya. Li'Tya is a unique range of natural spa care treatments that integrate the precious qualities of the Australian earth and spirit and combines the profound wisdom of ancient Aboriginal medicines, spirituality and healing modalities. The combination of the pristine environment, a sensitive and sustainable spa space and the healing hands of our spa specialists, Bay of Fires Lodge Spa is a perfect destination to rest and relax after walking to the Lodge. This is an opportunity to experience and embrace the simplicity of nature and the sense of wellbeing that follows. Spa treatment is at additional charge. Please contact us to book prior to your trip. Gourmet food & wine: Each night your guides or lodge managers will prepare scrumptious three-course dinners using fresh Tasmanian produce to be enjoyed with a selection of Tasmanian wine. In the mornings wake up to the aroma of hot coffee brewing, pancakes, freshly baked bread, fresh fruit salad, cereals and a cooked breakfast. 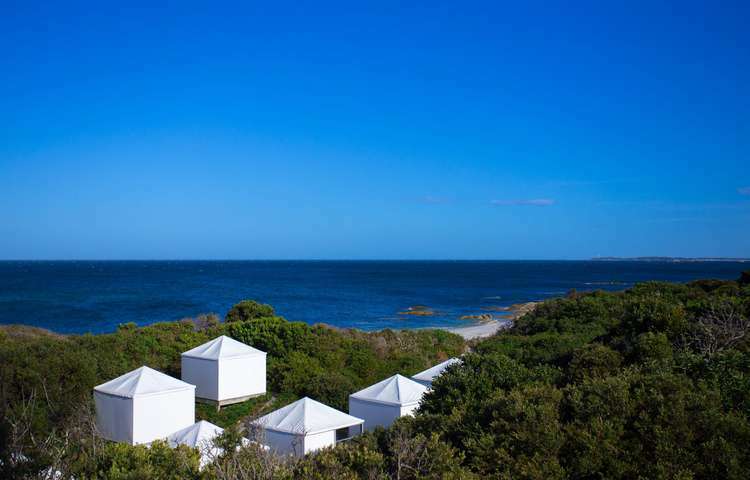 Forester Beach Camp Nestled in a protected dune swale behind a glorious white sand beach, Forester Beach Camp has been designed as a demountable seasonal structure. Twin-share rooms with timber floors, canvas rooves and full kitchen facilities provide perfect seclusion in a setting of unspoiled beauty. Private wash areas and composting toilets provide comfort without harming the environment. We've obtained special permission to operate this camp within the National Park, so close to the beach and yet so private. Here, you can swim or snorkel in the shelter of a natural, rock-ringed 'harbour', enjoy your meals on the outdoor decks or picnic on the beach under the biggest starry night skies. The Bay of Fires Lodge Set on a hilltop, 40 metres above the pounding of the sea and surrounded by National Park, the Bay of Fires Lodge is the only building on 20km of outstanding coastal wilderness. Enjoying views up and down the pristine white sandy beaches in an area of great significance to the Aboriginal community, a truly ecologically-aware building has been gently let into the landscape. Two long timber and glass pavilions allow maximum connection to the landscape with minimum impact on the environment: all building materials - Tasmanian hardwood and plantation pine - were lifted in by helicopter or hand carried to the site. The lodge is autonomous in providing and managing its existence. Here you will experience true communion with nature in accommodation that combines simplicity of design with comfort and warmth. In the magnificent living area with its large timber deck and open fire, you'll enjoy delicious meals prepared with the freshest local produce, accompanied by fine Tasmanian wines. Solar power provides the lighting, while hot showers and comfortable hotel beds add a touch of luxury at the end of each day's activities. All accommodation at the Lodge is twin or double share, with king size mattresses. The luxury walk will surprise you with the quality of the food and wines. Each night your guides or lodge managers will prepare scrumptious three-course dinners using fresh Tasmanian produce to be enjoyed with a selection of Tasmanian wines. In the mornings wake up to the aroma of hot coffee brewing, pancakes, freshly baked bread, fresh fruit salad, cereals and a cooked breakfast. Bay of Fires Lodge Walk guests meet at Quamby Estate between 8:15 and 8:20am. Launceston pick-up is 7:50am at The Sebel Launceston. After a gear check and introductions we journey to Mt William National Park via a scenic route that includes the rich pastoral landscapes of Scottsdale and the tin-mining town of Derby. We reach the northern part of the Mt William National Park and begin walking at Boulder Point. Views to the north include the Bass Strait Islands (Flinders, Cape Barren, etc). Lunch is enjoyed in the company of native birds, interesting shells and marine artefacts on one of the many pristine beaches nestled into the coastline. The evening is spent at Forester Beach Camp in twin-share, semi-permanent tents. Meals are usually spent relaxing on the deck and enjoying the surrounds of the dune swale location. Following a relaxed breakfast at the camp we walk south, absorbing the magnificent coastline colours and the solitude. Walking along ridge-lines of sand-dunes, one can enjoy views across heathlands and across the ocean to the east. Exploration of the marsupial lawns often reveals quiet native animals and the many tracks they leave behind. Lunch is at one of the coves sheltered behind the dunes near Eddystone Point Lighthouse. The afternoon is enjoyed in the seclusion of beaches and coves that lead gradually to afternoon tea at the Bay of Fires Lodge. Once at the Lodge you may wish to indulge in one of their famous spa treatments - you can pre book with us to avoid disappointment. The evening is spent relaxing at the majestic Bay of Fires Lodge, in twin share or double rooms. Meals are prepared by your Lodge hosts and guides and accompanied by fine Tasmanian wine and beer. The library can be a source of reference material or just light reading as well as games for the evening. Based at the Lodge, the day is yours to decide how you would like to enjoy the area. Rise early and experience the many native birds accompanying the dawn, or, if you’re lucky, watch whales glide down the coast or dolphins surfing waves. You can sleep late and be woken by the aromas of a hot-cooked breakfast and freshly brewed coffee. 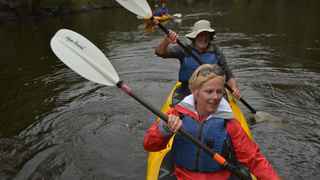 During the day you can choose to kayak down the Ansons River and experience the riparian ecology of this winding river. Cross the bird rich waters of Ansons Bay and conclude with a stroll over the dunes of Abbotsbury Peninsula back to the Lodge. Other options for this day include enjoying a spa treatment, fishing, snorkelling in the marine nursery, exploring the nearby shell coves or generally enjoying the surroundings of the Lodge. In the evening you can go for a walk, and depending on the weather, you may encounter wombats, wallabies, Forester kangaroos, possums or even a Tasmanian devil. The night sky is an awesome spectacle from the pristine vantage point of the Lodge and its surrounds. Following a leisurely breakfast at the lodge, there is time for a morning swim or final spa treatment before we depart. Walking through eucalypt forests and coastal heathland, tranquil conditions are often experienced during this last section of the trek. After enjoying lunch, your return trip takes you along the North-east coast of Tasmania and back to Launceston. Over a glass of bubbles, you will celebrate the journey completed while taking in the beautiful craftsmanship of some of Tasmania's finest designers and master artisans at the renowned Design Centre. You have the option of leaving us at The Sebel Launceston around 5:30pm, Launceston Airport at 6:00pm or returning to Quamby Homestead approximately 6:30pm. Any additional luggage stored at our walker's base will meet you at your drop-off point by our shuttle driver. * This itinerary is provided as an example only - prevailing conditions and local arrangements may cause variation. Helicopter flights can be purchased additional to the cruise tariff as a package or individually. Our trips depart daily from 1 October through to 1 May. Meeting point: You can meet at the walker’s base at Quamby Estate at 8:20am (Walk to “The Stables” 200 metres from the homestead. At “The Stables” there will be a gear check and introductions prior to your Day 1 walk). For those staying in Launceston CBD, we offer a complimentary shuttle service from The Sebel Launceston. You will need to be ready at the front of The Sebel at 7:40am for a 7.50am sharp departure. Due to tight time frames on the first morning of the walk, we do not have the capacity to pick up from several locations. What accommodation is included for the walk? The first night will be spent nestled behind the dunes at Forester Beach Camp for the second and third night you will enjoy uncomplicated luxury at the award winning Bay of Fires Lodge. How many guest for each trip? Each trip requires a minimum of four and a maximum of ten guests on each departure. All accommodation is twin share. If the group is full and you are a single traveller, sharing is with another guest of the same gender. How many guides for each trip? What footwear should I wear for the walk? What do we carry and how much do we carry? Each person carries their lunch, personal clothing, toiletries, wet weather gear, plus any extras such as a camera. Sleeping gear is provided at your accommodation. As long as you regularly exercise, or are capable of walking between 9 - 14 kms for the first two days along beaches and rocky headlands, you will enjoy your walking holiday. There is plenty of time each day to sit and rest as well as explore If you have any concerns about fitness please call and speak to one of our staff members. What food is included in the walking tour? All meals are provided, including scrumptious three-course dinners with fresh Tasmanian produce prepared by your gourmet cooks/guides. We are happy to cater for special dietary requirements, we just need to know in advance. We strongly recommend travel insurance. Consideration needs to be given to our cancellation policy, injury, evacuation, delayed flights, illness, etc. The weather is one of the attractions of the north east coast and the area has the mildest climate in Tasmania. However, weather conditions are changeable and cold conditions are often experienced. If you follow our gear list you will be comfortable, and prepared for any variations in the weather. What accommodation options do we have pre and post walk? Quamby Homestead (4 star) is located 25 minutes west of Launceston, and it is a great pre- and post-walk option. The homestead is located on the same estate as our walkers' base (only 100m away), so it is very convenient. Quamby has beautifully appointed rooms in one of Tasmania’s premier historic homes. The homestead offers continental and hot breakfast options, as well as an airport shuttle service. The Sebel Launceston (4.5 star) is an elegant, European-inspired boutique hotel located within walking distance of Launceston's CBD and colourful Seaport. Integrating boutique elegance with style and convenience, the all-suite accommodation comprises 49 beautifully detailed, fully self-contained, spacious 1 and 2 bedroom suites, all with separate bedrooms and bathrooms, many featuring a spa bath or laundry. The hotel also features a convenient fitness centre and is located in the centre of town, close to all of Launceston's Major attractions. There is no disputing the healing qualities of water. At the Lodge Spa it has created a private pavilion designed to fully submerge you in nature overlooking the Bay of Fires. Choose from these beautiful bath blends and soak up the view. A powerful blend of natural Tasmanian Peat that is rich in proteins, trace elements and minerals and pure Essential Oils of Grapefruit, Neroli, Sage & Sandalwood. A wonderful skin hydrator and works to soothe muscle tension. A beautiful combination of pink salt crystals and fragrant Australian flowers, leaves, fruits & berries that stimulate through aroma and colour. This cleansing & nurturing soak will help ground the spirit & re-mineralise the body. A refreshing skin soothing blend of Honeysuckle, Lemon Scented tea-tree and Sandalwood to revitalize & invigorate. This bath is excellent for treating dry, sensitive skin conditions, bites or eczema. The Spa signature treatments are designed to reconnect mind, body and spirit from head to toe. You will be on a journey to complete relaxation. Awaken, rejuvenated and ready to embark on life's adventures. A refreshing, powerful skin recharging full body exfoliation therapy that integrates native aromatic oils & Australian Sea Salts to cleanse and purify leaving skin smooth & soft. Your therapist will then guide you to the exquisite outdoor bathing pavilion, wash away the stresses of the outside world in the beautiful Ocean Dreaming bath blend. 'Breathe' and reconnect to your inner self. This treatment is perfect for the walkers - focusing on the back, feet, head & shoulders. To begin your Spa escape, a therapeutic back massage tailored to your specific needs. Apply a Kunzea Muscle Balm to further help relieve muscular pain & tension. Surrender your senses to the mesmerising Paudi head treatment. Incorporate a foot therapy to heal, smooth and return vitality to tired feet. Integrating Australian native ingredients such as Lillypilly, Tasmanian Kelp & Macadamia, this is an ideal pick me up treatment to cleanse & nourish your skin. The perfect accompaniment to all body treatments. Tasmania experience four distinct seasons. Its climate is described as mild temperate maritime. The warmest months are December, January, February and March with average temperatures of around 21°C. OCT4 Pty Ltd trading as ONLY LUXE CLUB acts as travel agency and work with different tour operators. All pricing is in Australian dollars and are quoted on a per person twin share basis. A supplementary price is available (see below). Bookings are not confirmed until full payment and the signed Booking Form has been received by ONLYLUXE CLUB. All accommodation is twin share. Single guests will share with someone of the same gender. If a single room is demanded, a supplementary price of will apply. The supplementary price refers to our quotation and needs to be stipulated at the time of booking. Please Note: Cancellations must be advised in email and will take effect from the date they are received. The participant agrees to indemnify OCT4 PTY LTD, and its servant, tour operator and agents, in relation to any liability, loss and damage which the tour operator, or its servants and/or agents may incur as a result of the participants, negligence or misconduct during the tour. Smoking is not permitted on the bus, or in tents or in other accommodation being used by tour operator at the time that a trip is being conducted. Not suited for children under the age of 8. Local conditions may necessitate changes to sightseeing, walking and driving routes, camping and accommodation locations. While every effort will be made to provide the services and experiences as offered in our brochure, on our website, and in our trip letters, we reserve the right to vary your itinerary. In the event that we are forced to change your arrangements, substitute arrangements of a similar standard will be provided. The tour operator will not be liable where interruptions to itineraries are caused by weather conditions, technical problems to transport used by the tour operator, industrial action, political or civil commotion or other circumstances beyond our control. We refer you to the conditions regarding travel insurance. While we will do its utmost to honour its pricing unforeseen circumstances may mean that prices may be subject to change without notice. You need to advise OCT4 PTY LTD and the tour operator on any pre-existing medical condition, mobility impairment and/or disability that might reasonably be expected to increase the risk of your requiring medical attention, or that might affect the normal conduct of a trip and the enjoyment of other trip members. OCT 4 PTY LTD and the tour operator may require an assessment of your medical condition from a qualified medical practitioner. If you fail to adequately notify the tour operator of any pre-existing medical conditions and/or disability, the tour operator reserves the right, at its reasonable discretion, to cancel your participation in a trip at any time, including after the commencement of your trip, with no right of refund if your medical condition, mobility impairment and/or disability could be reasonably expected to affect the normal conduct of the trip and the enjoyment of other trip members. The walks take place in very special wilderness settings. The tour operator is at the mercy of nature in all her beauty and all her fury. The tour operator will under no circumstance knowingly place at risk the health and well-being of our guests and guides. In the case of natural threats, acts of God and the like (e.g. bushfires, impassable snow, etc) the tour operator may need to cancel a walk with very little notice. In some cases, this can occur after the walk has commenced. The tour operator reserves the right to cancel any walk up to 60 days prior to departure if a minimum of 4 walkers are unable to meet for a tour. If the tour operator needs to cancel for any reason, the cost of the walk or any other costs associated with travel to the designated pick up point, overnight accommodation, meals, etc will not be covered by the OCT4 PTY LTD and therefore we strongly recommend travel insurance be taken out prior to travel. 'Force Majeure' means (without restriction) any event which OCT4 Pty Ltd or its third party providers could not, even with due care, foresee or avoid. Force Majeure covers events such as, but not limited to, adverse weather conditions, fire and all similar events beyond our control. In the case of Force Majeure OCT4 Pty Ltd will not accept liability, and reserves the right to change and cancel trips. In rare circumstances, due to injury or unforeseen illness, the tour operator may need to evacuate you from a remote part of the walk. Helicopter evacuations are expensive and in most cases will be at a cost to the customer. For Australian residents, under the Australian Government Medicare Act, it is prohibited for any domestic travel insurance product to provide any financial reimbursement with regard to ambulance or air ambulance services. We therefore strongly advise our customers to take specific ambulance cover through their health insurance provider. Evacuation cost will not be covered by the OCT4 PTY LTD and therefore it is also strongly recommended that our customers take out travel insurance to cover (amongst other things) the costs associated with evacuation. In view of the heavy cancellation penalties applied to cancelled reservations in certain circumstances, we strongly recommends suitable travel insurance be purchased at the time the holding deposit is paid. We recommend insurance cover that covers any loss which may be suffered due to cancellation. We also strongly recommend comprehensive travel insurance against loss of baggage and medical expenses. Bay of Fires walk has been on our bucket list for a while. My husband and I finally did it! We loved everything about the walk. The scenery along the track was stunning. We stayed at the Bay of Fires lodge, which was luxurious. I would highly recommend the SPA at the lodge especially after a long day walking. All the meals we had were very typical 'Tasmania' - fresh & high quality, very delicious! We finally ticked off it from our bucket list. An amazing walking experience. Everything is as described here. The travel service was great too. A girl called Emily from the travel team was very helpful and provided us with a lot of useful trip information. They also helped us arrange accommodation before and after our walk. No hassle and very relaxing. Highly recommended. I'm from Canada and travelled to Australia with my family for our walking holiday. We did three walks in Australia and I have to say this is the best. I read Lonely Planet's article about best walks in Australia and the Bay of the Fires walk is on the list. Everything was great and as described. From guides, scenery, food, to accommodation, the whole package was worth it. Thanks to the travel team of ONLYLUXE CLUB. They were very helpful and knowledgeable. They helped us arrange our itinerary in Australia and connected three walks together. We had airport transfers, which made our trip so easy. The hotels they booked for us were great and convenient. Great walking holiday in Australia! Complimentary Pre-Walk Accommodation Included*Discover the rare beauty and extraordinary diversity of Tasmania's World Heritage-listed Cradle Mountain - Lake St Clair National Park. Over 6 days, walk the iconic Overland Track following in your guides' highly experienced footsteps. Walking the Overland Track is a challenging yet highly rewarding, life-changing experience across diverse landscapes from alpine plateaus to majestic forests. Almost half of the track is above 1000 metres in elevation on exposed plateaus in a remote area. You'll witness iconic sights such as the dramatic glacially-carved Crater Lake and Waterfall Valley, climb to Marion's look out offering spectacular views of Cradle Mountain with Dove Lake at its base. You will travel across plains where glaciers once sat and slowly moved, scouring out shallow tarns, visit Pellion Plains where you'll discover excellent swimming holes and abandoned copper mines. Your tour culminates with Lake St Clair, Australia's deepest natural lake. The walk around Lake St Clair is mainly through cool temperate eucalypt forest, surrounding by incredible bird life and finishes with a spectacular 17km cruise back to Cynthia Bay. Included in your tour is 5-nights twin-share accommodation, return transfers between Launceston and the walk base, all meals and non-alcoholic beverages, plus a limited selection of Tasmanian wines, as well as all National park passes, boat transfers across Lake St Clair, use of a backpack and Gore-tex jacket for the duration of the walk. This challenging and incredibly rewarding experience will be an adventure you remember forever. At every stage your tour will be enhanced by the knowledge and passion of the field guides who work tirelessly to ensure each guest is safe, engaged and well fed. Explore one of the world’s most breathtaking regions on this incredible 4-day experience. Discover Freycinet Peninsula and Maria Island on foot. To reach each spectacular location, you will sail aboard a 23 metre luxury ketch, Lady Eugenie. Each morning, you'll gain a unique perspective of the coastline from on board, before exploring the area on foot. You begin your journey in Hobart, here you will be transferred to the fishing port town of Triabunna where you will board a 23 metre luxury yacht, your base for the next 4 days, and set sail across the Mercury Passage for Maria Island, home of the World Heritage-listed convict site of Darlington. Once populated with prisoners, it is now home to an array of architectural relics and abundant wildlife. Take in the sights such as the Bishop & Clerk Peaks, Fossil Bay and admire views toward Schouten Island and Freycinet Peninsula. For those wanting a more relaxed adventure, you can visit the beautiful sandstone patterns and structures of the Painted Cliffs. You will also learn more about the island’s unique Aboriginal, convict and industrial histories whilst exploring the Darlington precinct. During this 4-day adventure you’ll visit Schouten Island, traverse Tasmanian Blue Gum forests, admire native wildflowers in grass fields, marvel at the incredible pink granite Hazards Mountains and take in the striking and iconic splendor of Wineglass Bay. This highly adaptable itinerary has been designed to suit walkers of every ability and level of fitness. You’ll be lulled to sleep by the gentle ocean waves each night on board the Lady Eugenie. Lady Eugenie's spacious decks are the perfect setting for relaxing whilst taking in the stunning scenery of Tasmania's east coast. During the evening, you can dine on delicious meals made from local produce in the comfortable saloon before retiring to your private cabin. This luxury package includes return transfers from/to Hobart, all nights aboard the 'Lady Eugenie' on a twin share basis and all meals as well as a National Park pass, backpack and weather proof jacket for the duration of the walk and two qualified guides and a skipper for the duration of the walk. Drift to sleep each night on board the Lady Eugenie, a 23 metre luxury ketch. Lady Eugenie's spacious decks are the perfect setting for relaxing whilst taking in the stunning scenery. During the evening, you can dine on delicious meals made from local produce in the comfortable saloon before retiring to your private cabin. This luxury holiday includes return transfers from/to Hobart, all nights aboard the 'Lady Eugenie' on a twin share basis and all meals as well as a National Park pass, backpack and weather proof jacket for the duration of the walk and two qualified guides and a skipper for the duration of the walk. The Freycinet and Wineglass Bay Luxury Walk covers the entire length of the Freycinet Peninsula on Tasmania's east coast. Walk through the pink granite Hazard Mountains and rich coastal forests to the pure white sand beaches of Wineglass Bay. Discover forests of towering white gums where you and your walking companions, a maximum of 10. Spend each night at the award-winning Friendly Beaches Lodge, nestled in its own secluded sanctuary, where delicious, candle-lit meals, steaming hot showers, deep baths and comfortable beds await. The four-day walk will take you off the beaten track to remote and rarely explored corners of the Freycinet National Park. Discover diverse marine and wildlife, nesting lagoons, wildflowers and other unique flora and fauna led by engaging and knowledgeable guides. Travel in the footsteps of the Oyster Bay Tribe, walking the same ancient tracks trodden some 30,000 years ago. Go by boat into remote and rarely explored corners of the Freycinet National Park.You'll feel like the only souls on Earth. You'll also have opportunity to go fishing, swimming and snorkelling and travel to uninhabited Schouten island. Choose between challenging mountain climbs or more leisurely coastal routes before regrouping at the end of the day. You'll also travel light, needing only to carry your camera and a small day-pack for lunch. Welcomed each evening to the award winning Friendly Beaches Lodge and unpack just once and sleep blissfully in private, comfortable rooms with warm, goose down doonas and quality, Egyptian cotton sheets. You'll enjoy stunning architecture and friendly genuine service. Hosts provide delicious meals using the best of Tasmanian produce; freshly caught flathead, local oysters, handmade chocolates, fresh fruit and premium Tasmanian wine and cheese. Just a few kilometres off Tasmania's east coast, Maria Island is 100% national park with a population of just two park rangers and their one car. This World Heritage Listed island is a sanctuary, and a Noah's Ark for rare Tasmanian birds and animals including an introduced population of disease-free Tasmanian devils. The Maria Island Walk is an adventure led by warm, friendly and knowledgeable local guides. The food is fresh and local, the wine is Tasmania's best, and a comfortable bed each night awaits. The walk itself is easy to moderate with options to add challenge as desired. The Arkaba Walk is a 4-day experience that immerses walkers in the story of the land. Set against the remarkable backdrop of the Elder Range and Wilpena Pound in South Australia's Flinders Ranges, this Arkaba walking safari is an opportunity to experience the outback in a style that is both exclusive and authentic. The Flinders Ranges offers some of Australia's most spectacular outback scenery. Nestled among this ancient geological monument, Arkaba's 60,000 acre private conservancy is home to an incredible array of bird and wildlife now protected by the Arkaba Wildlife Conservancy. Owners of Arkaba protect this ancient land and share it with those in search of an authentic Australian bush experience. This fully guided experience combines an outback exploration with a few key creature comforts and the result is an incredible bush experience. This expert guided 4-day-3-night walking safari traverses the incredible Wilpena Pound and 16,000 hectares of Arkaba's private wildlife conservancy, following the famous Heysen Trail. From the air, Wilpena Pound looks like a crater, an enormous bowl almost 100 kilometres (62 miles) wide that towers above the surrounding plains. You’ll learn about the history, geology and ecology of this unique landscape and walk in the shoes of its indigenous owners as you hear stories of their incredible heritage. 2 nights are spent camping in a deluxe swag set atop an elevated timber platform with views of this spectacular desert region. The final night is spent at the restored 1850s Arkaba Homestead - a luxury country farmhouse. All meals on this walk are freshly prepared 3-course affairs, accompanied by fine wine, like minded company and the sounds of the outback. This incredibly rewarding experience will take you deep into the heart of outback Australia. You’ll marvel at iconic scenery, native wildlife and indigenous culture as you traverse this ancient landscape. Complimentary Pre-Walk Accommodation at DoubleTree by Hilton Alice Springs or Crowne Plaza Alice Springs Lasseters (4 star) Included* The desert ranges of the Red Centre deliver the quintessential Australian experience on the Larapinta Trail. The end-to-end 223km long Larapinta Trail is one of Australia's most spectacular trekking experiences. The trail provides a rare perspective of vast flood plains, razorback rocky outcrops and the awe-inspiring scale of this ancient land. It also harbours many Aboriginal sacred sites of the Arrernte people. This trekking tour is ideal for the more ambitious walker with some challenging stages passing over remote ridges and canyons, walking up to 16 kilometres per day over 6 days. Traversing the high ridgelines of Alice Springs, you'll experience this ancient land from a perspective only few have witnessed. You will be supported by expert local leaders with full knowledge of the area and environment, providing with the insight story of the Australia's most iconic desert trek. This Larapinta Trail walk is enhanced with stylish, award winning architect designed, semi-permanent wilderness campsites, which come complete with hot showers and a heated dining and lounge tent, exclusive to you the Larapinta Trail. At each camp you will be provided with high quality, interesting and nutritional meals to support your daily energy recovery. While you walk, your support vehicle transfers your luggage and camping gear to the next campsite leaving you only to carry a day pack while you hike. The Larapinta walk includes all nutritious meals, prepared by your guides, 5 nights' accommodation in exclusive semi-permanent campsites including safari tents, stretcher beds, swags and hot showers, all group camping equipment, National Park fees and fees to Traditional Owners as well as off-road transport from Alice Springs. Adventure into the harsh surrounds of the Australian outback. The Larapinta Trail will delight wilderness lovers and challenge the seasoned hiker. In the footsteps of traditional owners, early explorers, and modern adventurers, the stories of the Larapinta Trail will come to life with every passing desert step. Discover the rare beauty and extraordinary diversity of Tasmania's World Heritage-listed Cradle Mountain - Lake St Clair National Park. Over 4 days, walk the iconic Overland Track following in your guides' highly experienced footsteps. This moderately challenging four-day, fully guided walk starts at Waldheim in Cradle Valley, walking south along the Overland Track, then west along the Innes Track to Arm River, near Lake Rowallan - all located within Cradle Mountain - Lake St Clair National Park and Tasmania's World Heritage Area. Cradle Mountain - Lake St Clair National Park, with its ancient rainforests and alpine heaths, is one of the state's most special places, where ancient pines fringe glacial lakes and icy streams cascade down rugged mountains. Walking the Overland Track is a highly rewarding, life-changing experience. Almost half of the track is over 1000 metres in elevation on exposed plateaus in a remote area. In the evening, unwind and relax in the comfort of the only private accommodation along the trail. Enjoy a hot shower, sumptuous meals, freshly baked bread, a glass or two of Tasmanian wine and a comfortable bed. Your tour includes four days of walking with two passionate and educated guides, 3 nights twin share accommodation, return transfers between Launceston and the walk base, all meals and non-alcoholic beverages, plus a limited selection of Tasmanian wines, and all National Park and Overland Track passes and use of a backpack and Gore-tex jacket. Discover the incredible beauty of this iconic part of Tasmania. This rewarding experience will be an adventure you remember forever. At every stage your tour will be enhanced by the knowledge and passion of the field guides who work tirelessly to ensure each guest is safe, engaged and well fed. Experience Australia’s greatest river, The Murray in South Australia. Over 4 exhilarating days, explore its red-gum forests and wetlands on foot and by boat encountering wildlife, waterbirds and spectacular cliffs while discovering the stories of this ancient landscape. Dine and relax each night on floating houseboat accommodation. The Murray River lies within the internationally recognised Riverland Ramsar Wetland of International Importance in South Australia. A combination of guided walking and peaceful cruising immerses you in this unique landscape, exploring the rich river heritage including Aboriginal culture, pastoralism and the intricate network of paddle-steamers, locks and weirs that operate within this fascinating river system. This is a wildlife spotters paradise, the wetlands area is renowned for its water birds, the endangered Southern bell frog and the handsome Regent parrot. Encounters with Red and Grey Kangaroos, emus, black swans and pelicans are a regular occurrence on the Murray River and 179 bird species have been recorded, including the elusive Red-capped Robin and mischievous Fairywrens. All water transfers and the Day 4 return cruise from Bunyip Reach cliffs to Renmark are on a 12-seater catamaran cruiser which your guides will expertly navigate through more than 70km of tranquil waterways. At the end of each day's walking, you will be greeted with a beverage at the campfire before a 3-course dinner and a restful night in the comfort of a double room with superb river views on board your floating houseboat accommodation. As well as all guided walking and cruising, your tour includes 3 nights' accommodation on board modern houseboat accommodation, all meals, Riverland roasted coffee and local chocolate. A highly enjoyable and memorable way to learn about a complex ecosystem. Your highly knowledgeable and experienced guides will inspire you with their passion for the region, leaving you with memories of a beautiful and diverse wetland landscape.